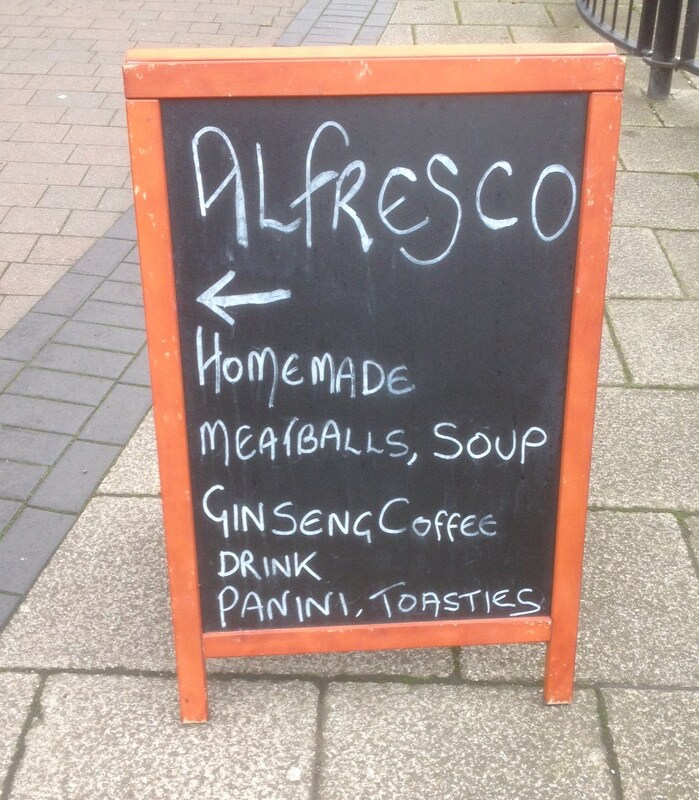 My first encounter with Alfresco in Bridgford Park came about as I was walking along Central Avenue in West Bridgford and chanced upon their Chalk Board in the middle of the pavement. There was an arrow and the words ‘Homemade Meatballs’ and I like Meatballs. It was a bit of a grey and overcast day and I was thinking that maybe this was a sign, the forecast clearly was “Cloudy with a Chance of Meatballs” and well that was enough to just send me straight into autopilot. 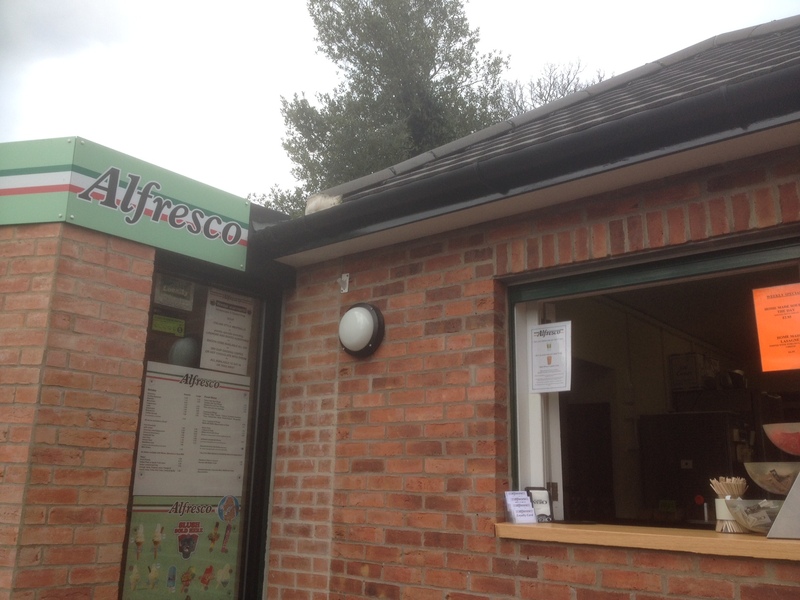 Without a pause for thought, or memory of why I had originally driven into West Bridgford, I turned left into the park and found myself at the doors and window of Alfresco peering hopefully across the counter for some Italian Meatball Action. OK lets get down to it, as we know I had been drawn like a meatball magnet to Alfresco by that chalkboard sign and so I was always going to be ordering a portion of their Italian Meatballs. 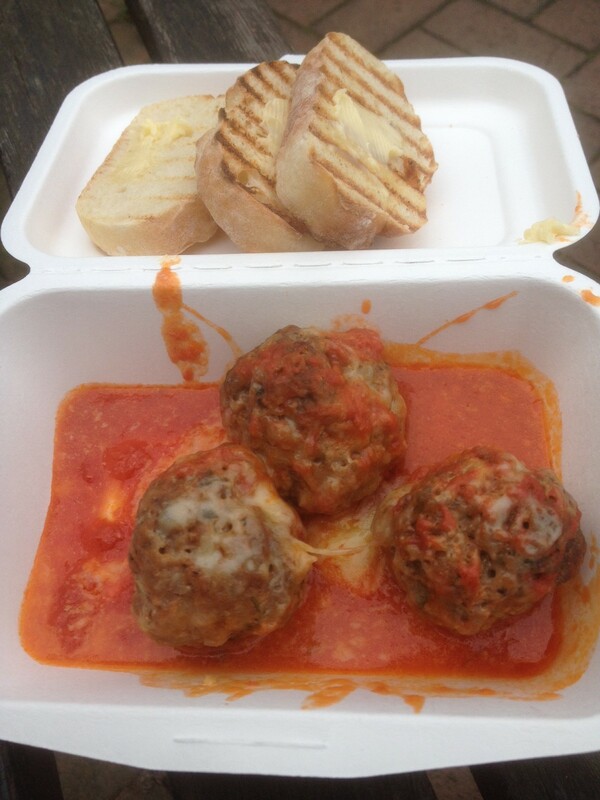 These were indeed worth being sidetracked away from the Avenue, I swapped my £3.50 in shiny and gold coins for a box that contained some of the best meatballs I have bought for a while. I would have been happy if I had bought these from a decent Italian restaurant, yes I was pleasantly surprised. The balls were a firm, solid, and meaty bite. I tried to get the chef to tell me what was in the meatballs but he just smiled at me and confirmed it was a secret. I am just going to have to guess, I am thinking that it was a two meat blend and if I was a betting man I would say pork and lamb. There were flecks of some sort of fresh green herb in there as well, probably flat leaf parsley. There was also some sort of cheese and maybe some flecks of red pepper. Essentially you can tell these are homemade. Now I make a lot of meatballs at home and I would have been happy if I had served these up to one of my guests. My only groan is the price point at basically £1 a ball. Still you do get some decent tomato sauce, parmesan cheese on top and some crusty bread, and they are really very good so perhaps that is fair. At Alfresco you don’t actually have to go ‘alfresco’ there is a nice inside space where you can sit and eat at one of the tables or at the high stools by the serving hatch. You can sit outside in an open seating area by the hatch. If you don’t want to sit out there you can wander off into the park with your food instead, which would be my personal choice as bridgford has a nice park. Now for me it was all about the meatballs but if that isn’t your thing or you fancy a simpler bite, well they do have plenty of your traditional café kiosk items on the menu. Within the bread filled with stuff arena you can choose between a sandwich with two fillings for £2.60, a Toasted sandwich with two fillings for £2.75, and a Panini with, yes you guessed it, two fillings for £3.50. There is a multitude of fillings to choose from, personally I am probably going to be picking from one of ‘chicken, ham, tomato, sundried tomato, tuna, cheese, or parma ham’. If you just need a bit of a comfort sandwich you can get bacon cobs ‘all day’ for just £1.70. They do also offer other specials, at the moment that seems to be ‘Homemade Soup of the Day with bread” for £2.95 and “Homemade Lasagne topped with tomato sauce and cheese” for £4.95. It may change as the temperature rises towards the summer. I did have to return for the Homemade Lasagne for £4.50. 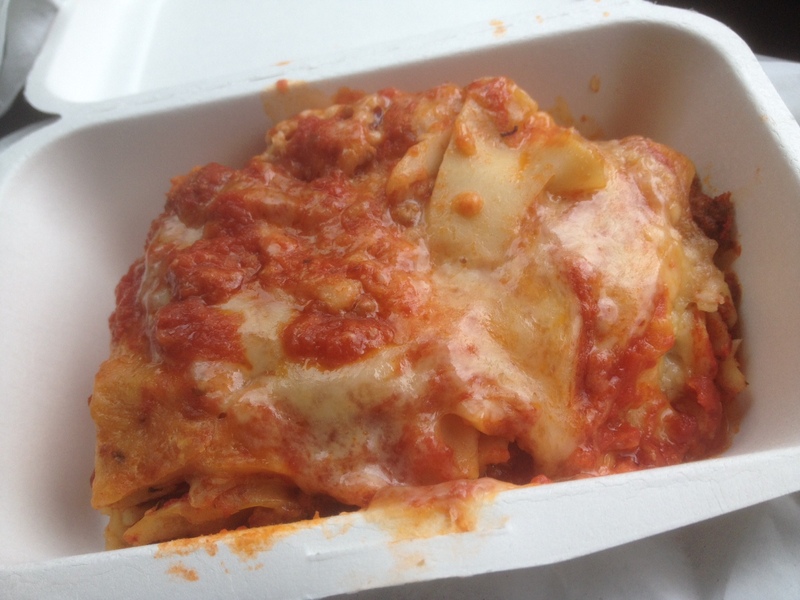 It is a good lasagne, lots of lasagne pasta slices and really it is more about the tomato based topping and cheese than any filling. If you are looking for a meat based feast well this is not for you, this is for the lasagne traditionalist and is a very comforting plate or carton of food. Next Post Lady Bay Cafe is well worth a look – “It’s a wrap!”, a chicken wrap that is. 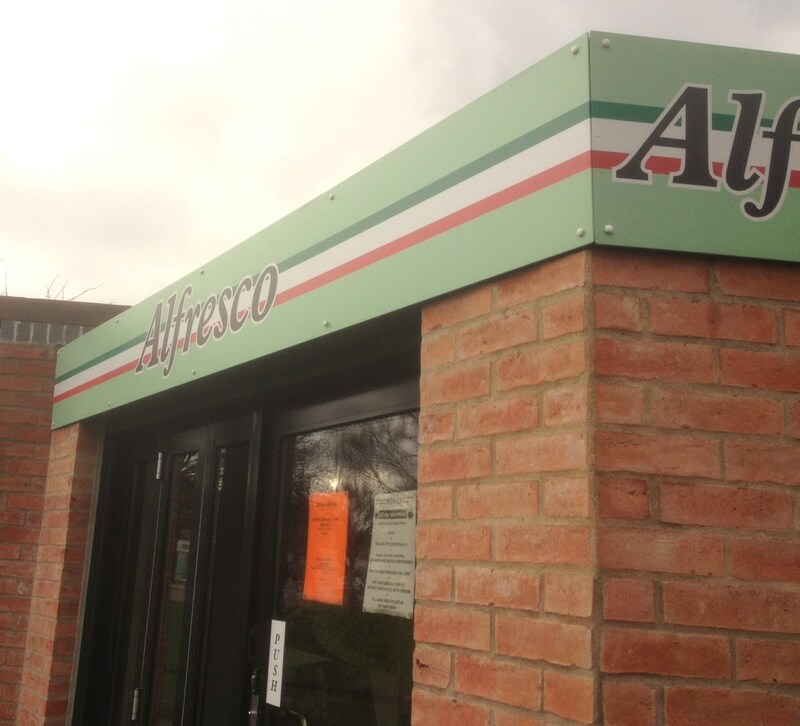 There’s also an Alfresco at the shopping precinct on Mapperley Top. Not very busy whenever I’ve gone past.